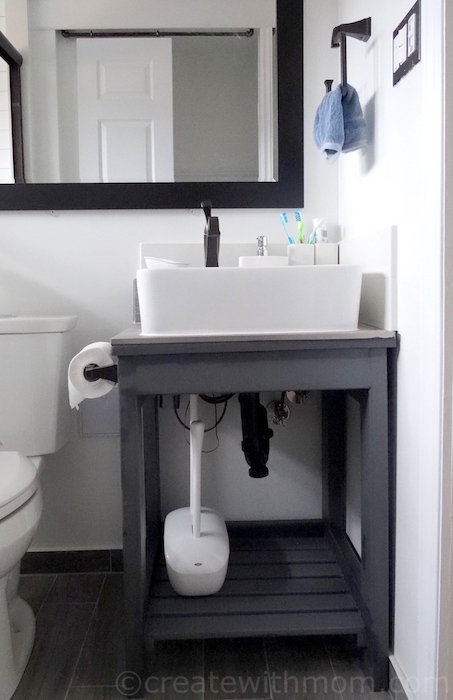 In our #BathroomReno we decided to build our own custom vanity to fit our need and space. 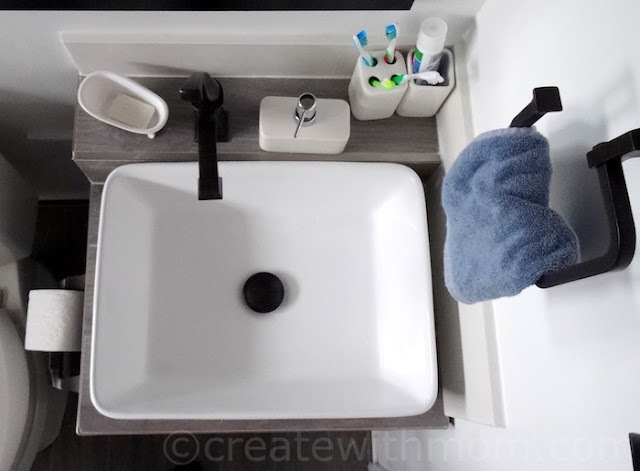 Instead of spending money for a ready-made vanity that restricts what we want in our vanity, our decision to build one allowed us to add a variety of features we wanted. We decided to keep our vanity open to make the bathroom feel bigger, and clutter free. Our design was simple, and the ideas are similar to this computer table. We liked the freedom of adjusting the dimensions of the vanity to fit our need, the vanity measures is 23"W x 22"D x 31"H. We built the frame of the vanity using a combination of 2x4, 2x3, and 2x5 wood. 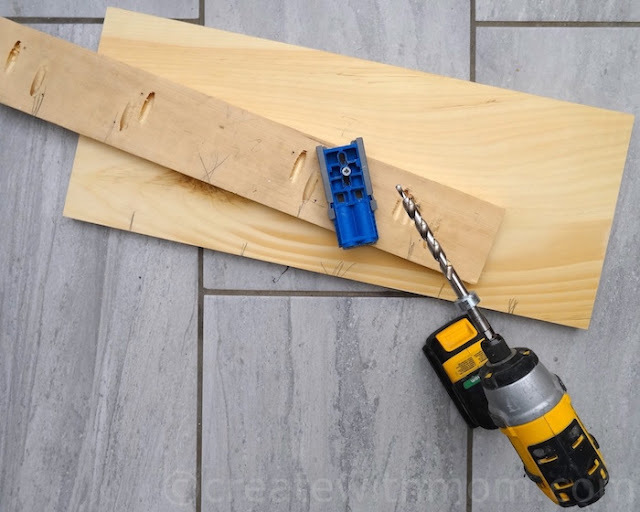 It was easy to connect the wood pieces using Pocket hole screws and a Kreg Jig. 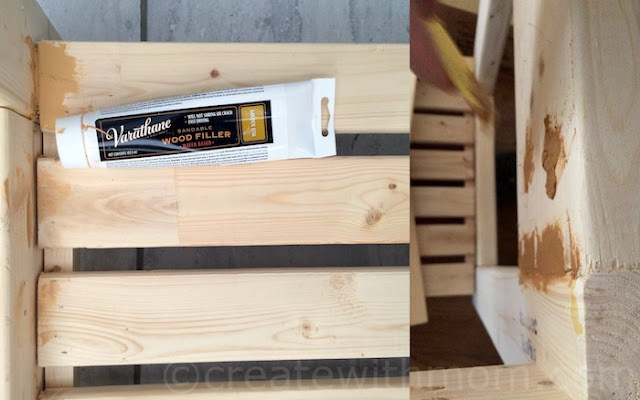 We used Varathane wood filler to fill in the gaps and nail holes. After the wood filler dried, we sanded it and got it ready to paint. 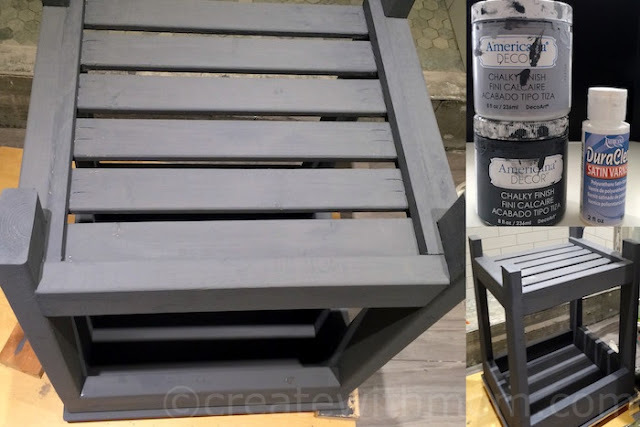 For the paint, we chose to go with a combined mixture of relic and yesteryear Americana Decor chalky finish paint, and varnished it to make it waterproof. This paint was easy to work with as we directly applied it to the wood. 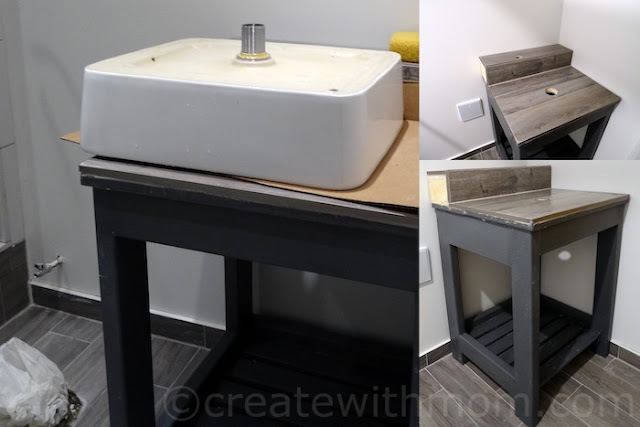 We purchased a rectangular 14"x9" vessel sink with a pop-up drain for our vanity. We spray painted the pop-up drain with bronze Rust-oleum metallic paint and primer to match the other accessories. Building it custom, gave us lots of options such as making a space to keep hand soap, toothbrushes etc. For the top we attached the same tile we used for the floor, and secured the wood and tile with an aluminum edging. 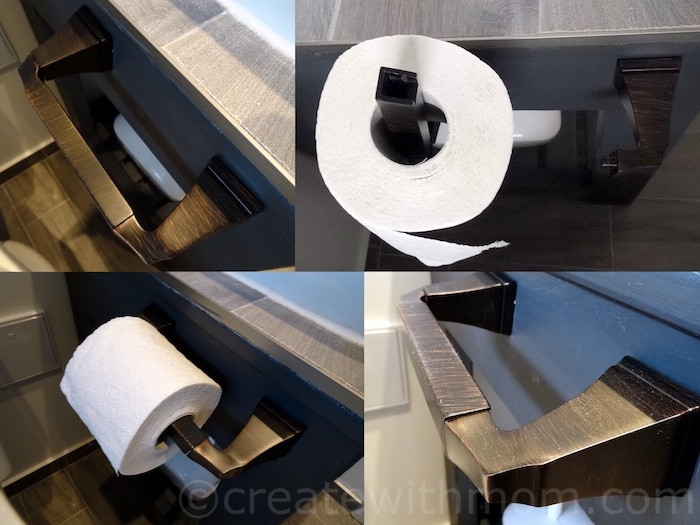 We attached the Delta Dryden toilet roll holder to the side of the vanity. 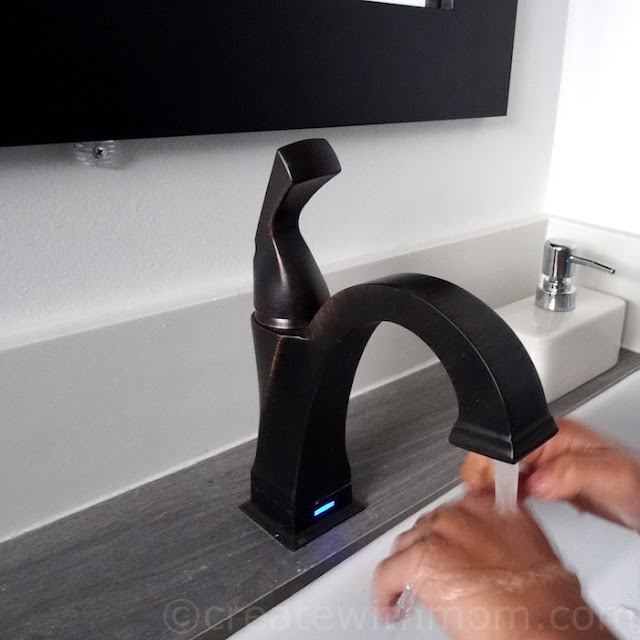 We added a Touch20.xt technology Delta Dryden single handle faucet because of its functional benefits. We placed white marble around the vanity as a backsplash. 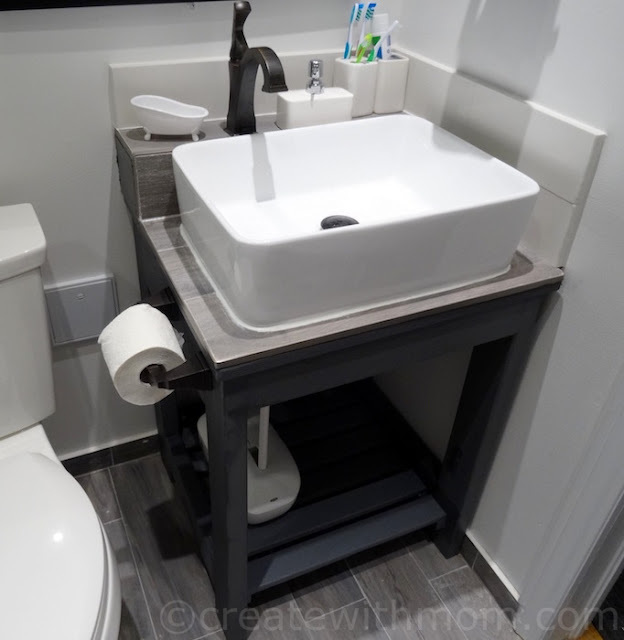 I am glad we were able to adjust the measurements for the height and width to suit our needs, so we can keep things like this fabulous OXO toilet and plunger under the vanity. When we were doing our bathroom project, and putting up the frames, tiles, and building this vanity the Stanley® Cross90™, a cross line laser came in handy. 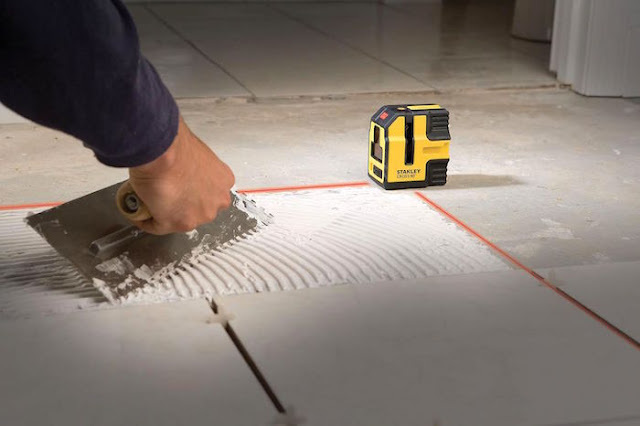 The Cross90™ cross line laser builds upon the convenience of the Cubix™ laser by projecting an additional vertical line, 90 degrees from the cross line. This 90 degree line is ideal for tile, flooring installation and partition walls. 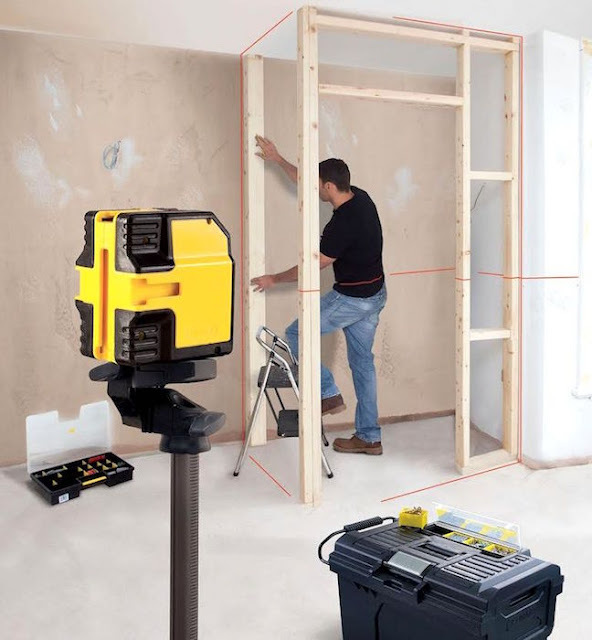 The Cross90™ laser has up to a 50 foot or 15m range and with an accuracy of +/- 3/16 inch. 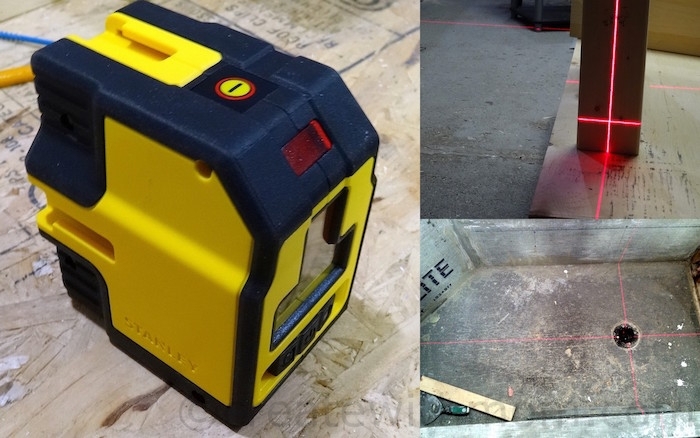 It features the same simplified 3 position control as the Cubix™ laser. 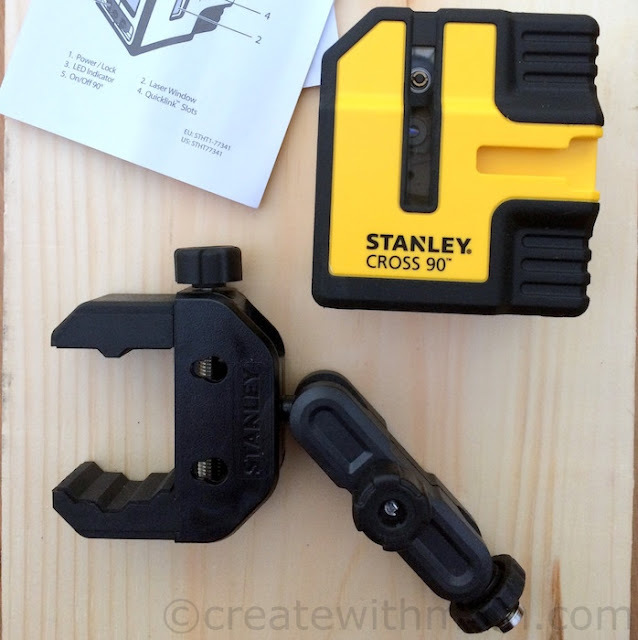 The Cross90™ cross line laser is available for approximately $169.99 at home centres and in the independent channels. That's a great idea. We are renovating the bathroom now and don't have an idea for the sink !!! 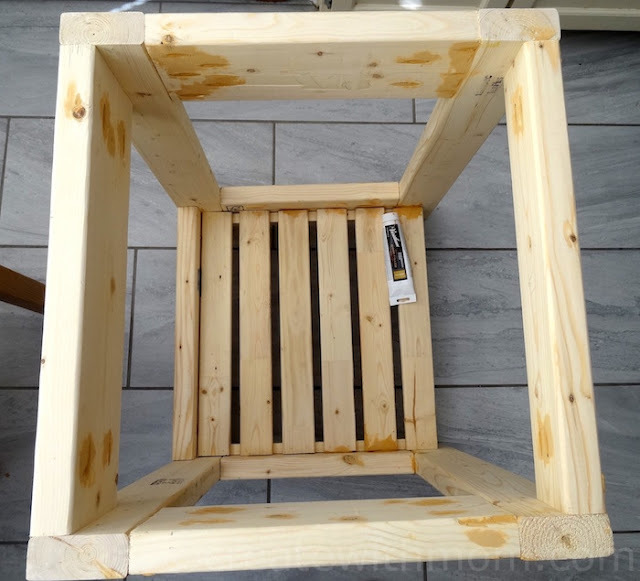 I love original DIY ideas...this vanity looks great and is one of a kind! looks great - and easy! thanks for sharing. Really love the look!! Definitely well done! Great job. I love the sink. Great idea. The water lines to the sink in my basement bathroom are not insulated and have frozen a few times and the vanity is very flimsy. I will adapt your idea. Thanks. Great job! You've made a unique vanity. I would never have guessed that you made that. It looks store bought. Very nice!! Great job, that look really nice! Awesome!! Not something I ever would've thought of doing!